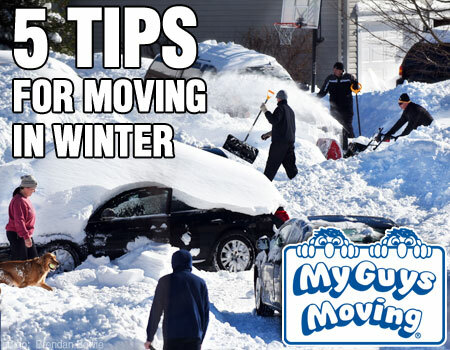 Words like moving and blizzard don’t go well together, but as movers in Washington DC, we thought we’d share some winter moving tips as the region digs out from “Snowzilla,” the 4th largest blizzard to hit the Mid-Atlantic that dumped 3.49 billion cubic feet of snow on the Nation’s Capital, according to the Washington Post. Clear the path. Remove ice and snow from your driveways, sidewalks and stairs at both origin and destination. Some folks forget to clear the destination which will delay the job. Spread sand or salt to prevent accidents. Professional movers like My Guys Moving will provide runners to protect your entryways and high traffic areas from the elements. Watch the weather & have an alternate plan. Communicate with your movers. Your move coordinator can be your best friend if your move date needs to be rescheduled due to a snowstorm. Remember that it gets dark earlier in winter, so try to book a morning start time for your job. Pack temperature-sensitive items. Possessions that can be damaged by severe cold, like house plants, should be insulated with bubble wrap or transported in a warm car. Other fragile items like fine china can crack when exposed to low temperatures, so use extra layers of packing material. Don’t pack liquids – they can freeze. Drain liquids from appliances, lawnmowers, and similar items. Get your vehicle ready. If you hire professional movers, you won’t have to worry about driving an unfamiliar moving truck through the snow. They will make sure the vehicle is serviced and ready for inclement weather, so you only have to consider your own car. Keep warm things like gloves & hats in the car with you, and make sure you have a shovel, ice scraper and salt, in case you need them. Board your pets. This is good advice throughout the year, but it’s especially practical in the winter – you don’t want a puppy getting lost in the snow. Plus, it’s less stressful for a pet to be in a calm environment without all the movement. Bonus Tip: Keep a Shovel in Your Car. During Snowzilla, over 11,000 airline flights were canceled. Even after resuming service, most travelers returned to find their cars buried in a couple feet of snow. So plan accordingly and check your airline and train station websites for cancellations. This video taken at Dulles International Airport shows the moving, plowing, and blowing of snow to reopen the runways. Bonus Tip: Sign Up for Text Alerts & Email Notifications from Washington Metropolitan Area Transit Authority to see if buses and Metrorail are running. The Washington Times reported that the Transit Authority shut down service for the entire weekend. DC Metro sheltered the subway trains inside underground rail stations to make it faster to resume service after the storm. Fun Fact: What is a Snow Dragon? This video by WJLA Washington DC shows the Snow Dragon, an industrial snow melter that liquefies about 60 tons of snow per hour. Watch as DC crews dispose of the collected snow by trucking it to parking lots at RFK Stadium where the Snow Dragon separates the trash from the snow, and the run-off drains into treatment systems that remove a lot of the oil and sediment before flowing to the Anacostia River.